Twenty-one snake species inhabit Pennsylvania, most of them found in the central region of the state. Most are harmless, although some venomous snakes are around. With many species in decline, their protection falls under Pennsylvania Fish and Boat Commission regulations. It's illegal to kill or remove any snakes considered endangered, so check a snake's status with the commission before removing unwelcome slithering visitors. Central Pennsylvania comprises the following counties: York, Bedford, Cumberland, Franklin, Dauphin, Huntingdon, Mifflin, Adams, Perry, Blair, Juniata, Fulton, Elk, Potter, Snyder, Lycoming, Centre, Clinton, Cameron, McKean, Clearfield, Tioga and Union. As befits such a large area, it includes various sorts of terrain and snake habitats, including mountainous areas, hardwood and conifer forests and agricultural fields. Two of the state's three venomous snakes are found in the region. Found primarily in forests, the large timber rattlesnake comes in two distinct color patterns in central Pennsylvania -- the yellow and black phases. The body is either yellowish or dark, with black chevron markings. The most common venomous snake in the state is the northern copperhead, generally found in woods and open fields. This medium-size, thick-bodied snake sports a greyish-brown background color with reddish-brown bands. The large, thin, black northern racer inhabits meadows and woodlands. The northern racer is easily confused with the eastern rat snake, who is thicker and heavier. 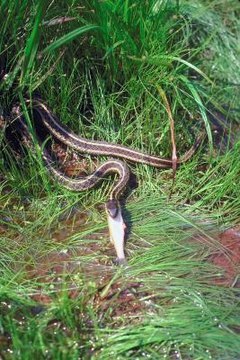 The eastern garter snake, found virtually everywhere, is greenish to dark brown, with yellow stripes and small red or black dots between the striping. The eastern milk snake, with a reddish body and black-bordered light blotches, is also found in various habitats. The dark eastern hog-nose snake can be identified by his namesake hoglike snout. The northern redbelly, found in woods, fields and bogs, is usually brown with a bright red belly. The medium-size queen snake inhabits streams, ponds and rivers. This olive-brown species has a yellow stripe on the side of the body and four brown stripes on his yellow belly. The mid-size northern water snake can live in almost any freshwater area, including bogs and swamps. This brown snake has yellowish bands around the body. The eastern and northern ribbon snakes both have light stripes on reddish bodies. Some Pennsylvania snakes mature at approximately a foot in length. These include the earthworm snake, so named because of his resemblance to an earthworm. The rare mountain earth snake, found in pine or woodland forests, is brown with small black dots. The dark northern ringneck snake is easily identified by the yellow-orange ring around the neck. The northern brown snake has parallel rows of dark dots along a light-colored dorsal stripe.